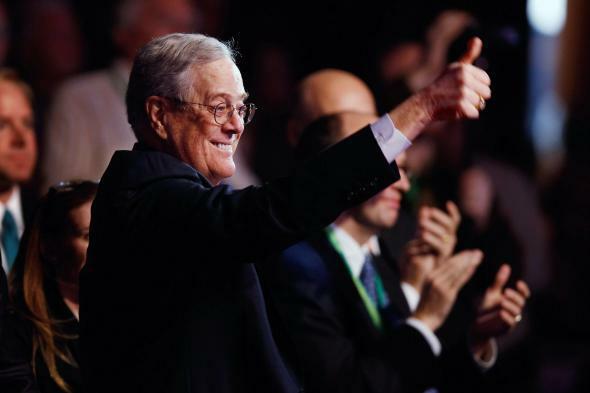 Koch dark-money machine: How David and Charles Koch could bring order to a chaotic 2016 Republican primary. The Koch Primary may not be a winner-take-all contest after all—that is, unless you count the Koch brothers. During an appearance on the Larry Kudlow Show over the long holiday weekend, David Koch suggested that the dark-money machine he and his brother run may end up “supporting several” Republican presidential hopefuls during the GOP primary. “If we’re happy with the policies that these individuals are supporting, we’ll finance their campaigns,” Koch said on the syndicated radio program, adding that he and his brother could start spending the roughly $900 million they hope to raise from their deep-pocketed friends as soon as this winter. Koch’s comments appear to be the first time that he or his brother, Charles, have said publicly that they plan to spread their cash around, rather than just focus it on one candidate. Until now, the brothers’ apparent game plan was to use the simple promise of their eventual spending to ensure that any legitimate Republican contender toed a policy line they and their wealthy friends favored, particularly when it comes to cutting taxes and rolling back government regulations that affect their business interests. But on those issues, the Kochs no longer have any reason to worry: The policies they want are already being touted by all of the GOP frontrunners. Since the billionaire brothers have already achieved that first goal, they’re now free to leverage their cash to achieve a second one. And, as Paul Waldman notes in the Washington Post, David’s latest remarks suggest that their new priority will be imposing order on what is promising to be a chaotic nominating contest. Backing a handful of candidates as opposed to just a single one may not sound like the most obvious way to short-circuit a prolonged primary fight—but doing so may actually be the most cost-effective option. As opposed to spending the massive sums it would take to clear the entire field, the Kochs can spend relatively smaller ones to weed out the dark horses and long shots with the least to lose in a drawn-out nominating battle. That will leave the Kochs with plenty of cash to pour into what will be a historically expensive general election. Right now, the cost of entry into the GOP race is remarkably low, which is why the field could balloon to 20 or so by this summer. But if the Koch brothers write some big-dollar checks in support of several leading candidates—Jeb Bush, Marco Rubio, Scott Walker, Rand Paul, and Ted Cruz are believed to be on the short-list—the price to stay in the race gets that much higher for everyone else. And those candidates who miss out on the Kochs’ cash will have a hard time finding a different conservative patron since other potential donors would know that the Kochs’ coffers won’t run dry. Someone like Sheldon Adelson could always decide to keep throwing good money after bad to back the 2016 version of Newt Gingrich, but Adelson will always know that the Kochs could cancel out his investment if they feel they need to. The Kochs aren’t the only ones hoping to narrow a crowded GOP field. Last week, Fox News announced that they’ll cap the number of Republicans on stage at the first GOP debate at ten—effectively halving the potential GOP field six months before the first nominating contest. If the natural winnowing process is slow to take hold from there, though, the Kochs appear willing to step in and clear out any GOP presidential pretenders that remain. If they succeed, they’ll be free to start spending their massive war chest on the battle they really care about—the general election—that much sooner.